First off I would like say that Carol was top notch on this presentation. As always it is awesome to see women in tech breaking it all down; and that she did. I would highly recommend that you check out her presentation if you can. Right off of the top of my head being part of this presentation was “OMG the possibilities with this platform are endless”. 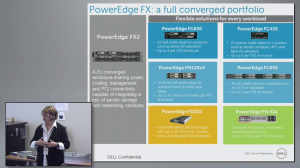 Thinking to myself hyper-converged in a blade footprint rocks. 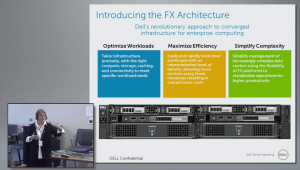 I know there are other platforms that are similar, but… The reason this was so appealing to me is that I was literally in a discussion the week prior to this and discussing the options of using Dell blades in an M1000e chassis and providing DAS (Direct Attached Storage) would be awesome as we move forward to such things as OpenStack (Ephemeral storage), vSAN and etc. That discussion ended up being that maybe going away from blades to pizza box servers might be the best choice. I love blades and what they provide so I was not too keen on this idea but if that is what it takes to get us where we need to go then that is what we will do. 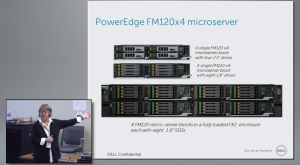 The reason behind not being able to do DAS in an M1000e chassis is because the only storage blade option in that footprint is an Equalogic storage blade but it provides iSCSI in the chassis only. This will not work because we want DAS provisioned to each blade. 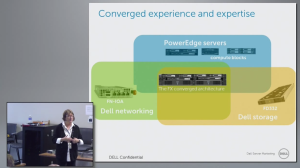 So fast forward to this presentation that Carol did on the new Dell FX2 Architecture. Now things start to get very interesting. What you get from a Dell FX2 Architecture is a 2U blade enclosure (PowerEdge FX2 Enclosure) that can contain up to four PowerEdge FC630 blades, eight PowerEdge FC430 (Coming Soon) blades, two PowerEdge FC830 (Coming Soon) blades, four PowerEdge FM120x4 blades or three PowerEdge FD332 (Coming Soon) storage blades. 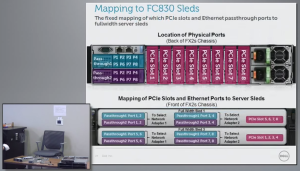 Also while going through this presentation I wondered about being able to use these blades or storage blades in an M1000e chassis (That would be too easy right?) but they are not interchangeable because the blades used in the FX2 Architecture have been shaved down to fit the footprint of the FX2 enclosure (and vice versa). OK no biggie. 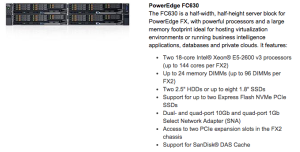 For compute based on the FC630 blades at this time you can get up to 2x18-core CPU’s (No Turbo or Hyper-Threading). This is the only shortfall that I see at this time (Maybe not so much?). This can get tricky when coming up with a memory to CPU formula (I know you are thinking…But you should not account for hyper-threading…Well it does play a part in the way we are trying to build our scaled out model). Monster VMs can skew the design going this route but for most this is not an issue. 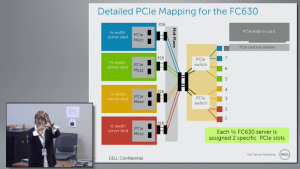 There are also still daughter cards that can be leveraged in this architecture (Fabric-A maps to the passthru modules and the Mezz slot maps to a Gen.3 PCI switch). 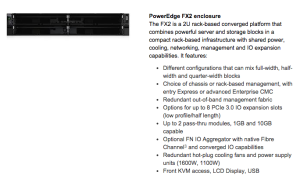 As for networking on the FX2 Architecture they have you covered. 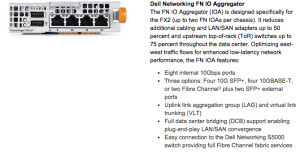 You can use 1Gb passthru’s (16x1Gbe) or you can use an FN IO Aggregator (max of 2/enclosure) which gives you eight internal 10Gbps connections downstream and Four 10G SFP+, four 10GBASE-T, or two Fibre Channel3 plus two SFP+ external ports upstream. This allows for LAG’s and VLT up to your TOR (Top Of Rack) switch. You can then run L2 up to your TOR. And there was also mention of FTOS (Force10 Operating System) coming to be integrated into the IO Aggregator itself (Now that will be cool). 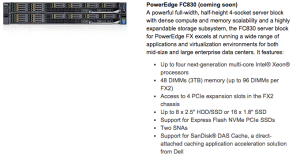 Hmmmmm…..Wonder how creative things might get then… 40Gb is coming soon!!! 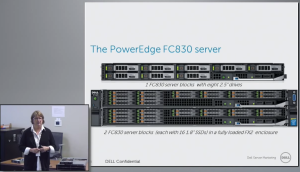 And for the PowerEdge FD332 storage nodes you can attach to a single blade or they can be split between FC630 blades ultimately splitting the storage in half (8 drives to each compute node). 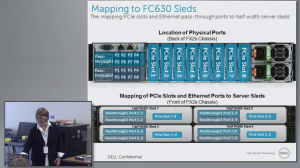 Also if you insert an FD332 below a PowerEdge FC630 the PCI slots for the bay where the storage node is placed are handed over to the FC630 Blade so you gain an additional four PCI slots on the compute node. All components are managed through CMC. 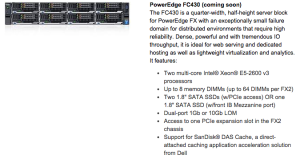 CMC can manage currently up to 20 FX2 Chassis stacks. It will look very similar to looking at CMC for an M1000e blade chassis. Some screenshots of the presentation (Snagged from the youtube presentation). 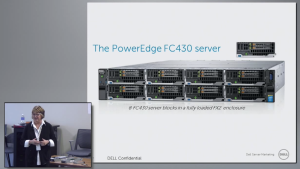 For me personally this presentation was one of the best technical deep dives on any of the new products. Of course this is mainly due to because I am an architect by nature and these sorts of talks resonate well for me.